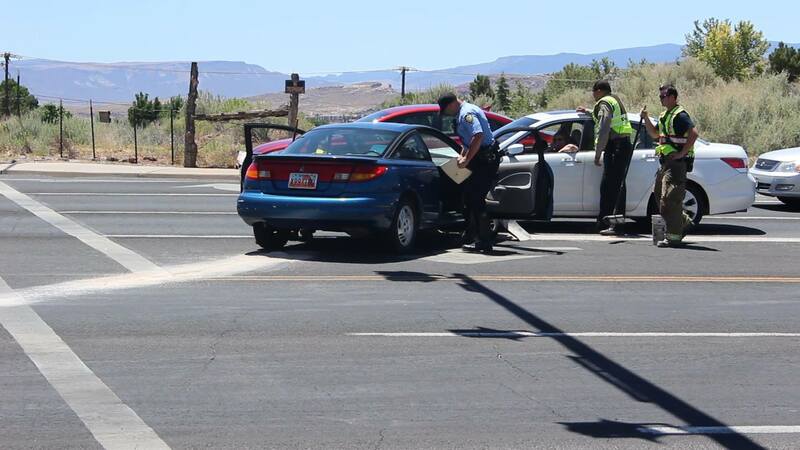 ST. GEORGE — Two people were injured in a collision Tuesday afternoon when a driver didn’t yield to another car at a yellow light and caused a four car wreck. The wreck occurred just after 12:30 p.m. at the intersection of Sunset Boulevard and Westridge Drive. St. George Police Officer Jamison Hale said that a blue Saturn was eastbound on Sunset waiting to turn left on Westridge. “The light turned yellow, that vehicle started to turn left, and hit vehicle two (a Kia Spectra) which was westbound on Sunset in the outside lane,” Hale said. After the impact, Hale explained, the Saturn spun around across Sunset Boulevard and hit a eastbound Honda Accord waiting to turn left at a red light. The Kia was thrown across the intersection by the collision and hit a Buick SUV that was southbound on Westridge waiting to turn right on Sunset. The driver of the Saturn was treated on the scene and transported to Dixie Regional Medical Center in St. George. Hale did not know the extent of her injuries. The driver of the Kia complained of neck pain but left the scene before treatment could be offered. The Buick driver sustained a possible broken hand and was privately transported by family members to DRMC for treatment. Hale said the Saturn driver was issued a citation for failure to yield to oncoming traffic. Units from St. George Police and Fire Departments, Washington County Sheriff’s Office and Gold Cross Ambulance responded to the scene, which slowed traffic on Sunset for about 45 minutes. Do we know for sure the saturn was at fault. Lots of people blow thru solid reds in this town all the time. You’ve often got to wait for a solid red to make a left turn just because so many will run the light. If only mormons would practice their “sunday best” on the road SEVEN DAYS A WEEK and not drive like it’s a cat-outta-hell free-for-all, imagine how much nicer our roads would be? LET ME REPHRASE THIS: YOU’VE OFTEN GOT TO WAIT FOR A SOLID RED AND THEN SOME. YOU’VE GOT TO WAIT AS LONG AS IT TAKES TO BE SURE THE CARS WILL STOP! I was waiting for a turn not to long ago, the light turned solid red, and 3 CARS BLEW THREW THE RED before traffic finally stopped and I could make my turn. The cat-outta-hell mentality is a real problem in this town. I still don’t get it. Never seen anything like it. Anywhere. Why can’t people make a left turn in this town?